Ridley Scott returns to the universe he created, with ALIEN: COVENANT, a new chapter in his groundbreaking ALIEN franchise. A beautifully lavish art book celebrates the vision behind the movie. 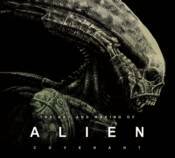 Sumptuous artwork and behind-the-scenes photography reveal the design and development of the movie, including interior sets, outdoor shooting locations, technology - and of course, the Aliens themselves.